Advantages: Plenty of useful photographs; esoteric subject area not otherwise well covered; logical structure by aircraft; line drawings of aircraft and submarines, scrap views and tables enhance the text; attractive colour profiles; colour walkaround section. 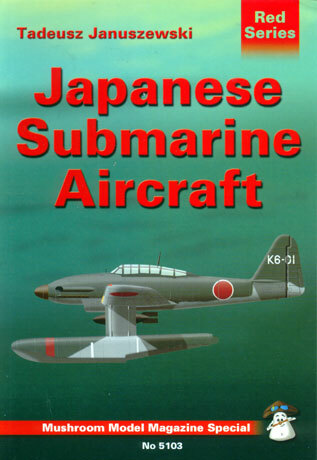 Mushroom Model Publications return to some serious esoteria with their latest release, "Japanese Submarine Aircraft". The book comprises 128 pages in 9.5" x 6.5" format, with soft covers and including a fourteen page colour profile section and a further seventeen pages of colour walkaround photos. After introductory text describing submarine aviation in general and the development of this field in Japan, the remainder of the book examines particular submarine aircraft by type. Each chapter is devoted to a specific aircraft, and is generously illustrated with photographs, plans, scrap-view drawings and tables. Seven aircraft types are covered, but the greatest attention is focussed on the Kugisho E14Y1 (Glen) and the Aichi M6A Seiran/Nanzan. The text throughout is clear, concise and logically organised. My only criticism with the book's format, in common with some others in this series, is that many of the photographs are quite small. A few interesting photos are also darkly reproduced, making it difficult to discern details. The fourteen page colour profile section includes multiple views of 13 prototype and operational submarine aircraft. The rare M6A1 Seiran at the Garber facility of the National Air and Space Museum in Washington is well documented with over 50 colour photographs. The interior is especially well covered. This book will be a valuable resource for any modeller building Japanese Submarine Aircraft, and to the aircraft historian.